Hey babes! Happy Monday! Hope y'all had a great weekend! I cannot believe the World Cup is over! Now what am I supposed to watch?! lol I love to mix prints. It's fun to do a little something unexpected. You don't have to go wild. Polka dots and stripes are always a good way to go. Do y'all like to mix prints? I love mixing prints! I actually have that same blouse and have worn it with a striped skirt. Super cute outfit! So cute! I love the mix of patterns! And your red lips! The mix of patterns here is so so so cute! Beautiful outfit! Love the mixing of prints and colors! Mixing prints is my absolute favorite! I adore this look on you!! Love this look and the print mixing! Super cute! Those shorts are the cutest! You look stunning! I love you hair!! Loving these mixed prints so much and everything looks amazing on you. Ahhhh. just love it so much!! Loving the polka dot and stripes combo! And that pup too! I love your pattern play, it is such a perfect outfit! I love the dots and stripes. Great combination for a fun look! Oh I love the stripes and dots combo on you!! Love that mix of prints! Great outfit! Gorgeous styling!!! Love how you paired things together!!! Beautiful! dear the shorts is really nice!!!!!!!! Love this combination! Those shorts are my favorite! Such a great mix of prints! your shorts are darling!! love the red lipstick to bring it all together too! Great outfit and love the shorts xoxo. 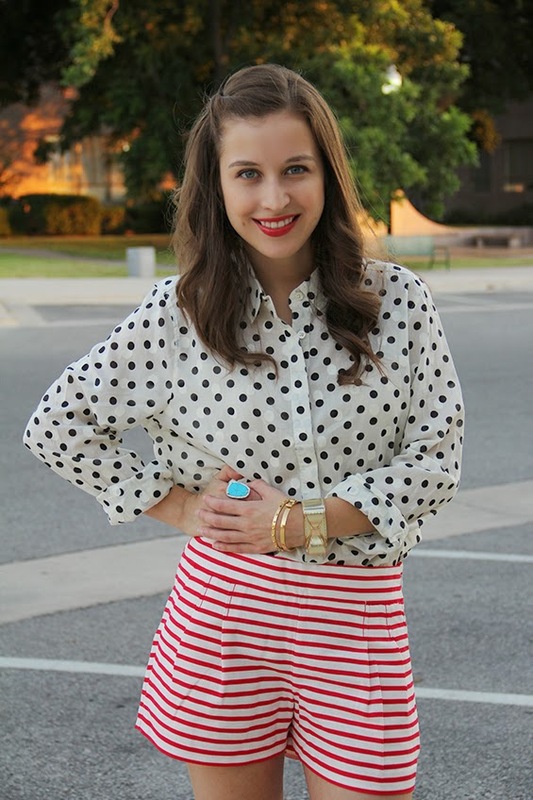 loving the polka dots and stripes together, and those shoes are everything! I LOVE this look. That puppy doesn't hurt either! So happy I found your blog!